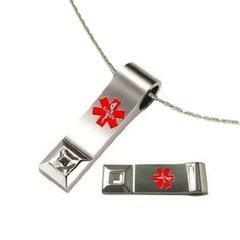 Key 2 Life ® EMR Medi-Chip USB Medi-Chip Portable EMR (Electronic Medical Records) tear drop necklace with swarovski crystal. Approximately 2 inches by 1/2 inch (5.08 cm x 1.27 cm). Necklace chain is about 24 inches long (60.96 cm).